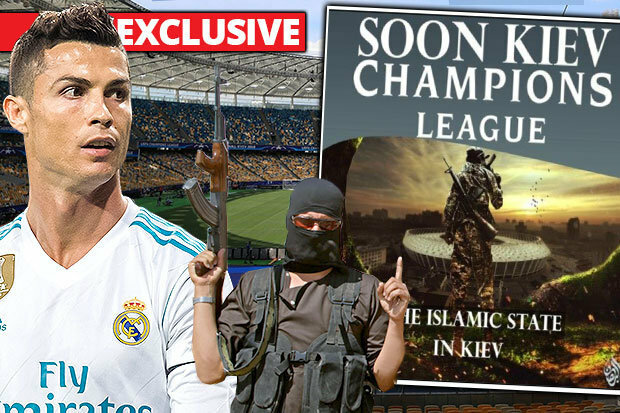 A cyber security firm, Sixgill - which helps monitor the activity of the ISIS terror group on dark web and other encrypted apps have reported that the terrorist group have sent out a chatter it will be in the Champions league final at Olimpiyskiy Stadium, Kiev on Saturday. The terror group which suffers defeat in the Middle East have released propaganda images of its group descending on the stadium, and in the posters shared online, a man with jump suit was seen with his head cut off, while a jihadist stepped on him. Sixgill, based in Israel, has warned and sent out warnings to help security agents, as the group looks to make a comeback to attack the West after suffering a ridiculous defeat in the Middle-East. Another chatter making rounds on the dark web is also a threat to football lovers that will be at the world cup. The group in one of its propaganda posters said they will be there to wreak havoc as well.